We are experiencing a very unusual Summer. Since the week before Christmas it has done little but rain, and the temperatures are lower than normal. Great for the Garden (I've never seen it look so lush) but not so good for people who desperately want to be at the beach! But the garden, oh my garden, is amazing. It's humid and wet here so we have huge plant growth, but big weeds also. 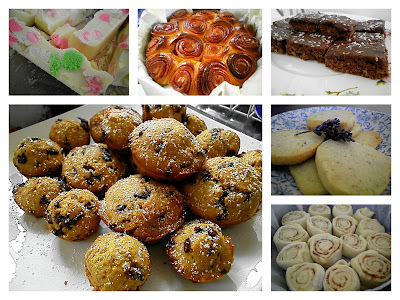 So to keep the little and big people amused, there has been a LOT of baking. Not so great for the post-Xmas waistline mind you. The good part of the bad weather is that I've had plenty of time with the Hooks out. Not much to show for it though as they are mostly on going projects but I love the wee cotton facecloths (Ravelry link here) I made over the New Year. Just before I go, don't you just love these beautiful Calla Lillies that grow in my garden at this time of year? Keep your fingers crossed for us that we get a few fine days soon so we can make the most of the school holidays. I am having total lawn envy!! Look at the lush lawn - beautifully mown. Wish we could be there and have a run around with your small folk. And us grown ups could sit on the deck at eat your delicious baking!!!! Man this weather has been sucky..but on the upside....we have overflowing tanks now!! haha. :) Your garden..(and all the cooking) looks fab!